What Is a Quantum Dot (aka QLED) TV? Despite some shortcomings, LCD TVs are the dominant type of TV sold to and purchased by consumers. The acceptance of LCD TV accelerated the demise of CRT and Rear Projection TVs and is also the main reason that Plasma TVs are no longer with us. In recent years, OLED TV, led by LG, has been touted by many, with its "enhanced" performance, as the successor to LCD. However, although it represents a step-up in TV technology, LCD TVs can still take it up a notch with the incorporation of Quantum Dots (aka QLED). Quantum Dots and QLED refer to the same technology. QLED is a marketing term that Samsung and TCL use in the branding of their Quantum Dot TVs. Image Showing Quantum Dot Structure and How They Are Made. For the purposes of application in TVs and video displays, a Quantum Dot is a man-made nanocrystal with semiconductor properties that can be used to enhance brightness and color performance displayed in still and video images on an LCD screen. Quantum Dots are emissive particles (somewhat like phosphors on a Plasma TV), but, in this case, when they are hit with photons from an outside light source (in the case of LCD TV application a Blue LED light), each dot emits color of a specific bandwidth, which is determined by its size. Larger dots emit light that is skewed towards red, and as the dots get smaller, they emit light that is skewed more towards green. When Quantum Dots of designated sizes are grouped together in a structure (more on this in the next section) and are combined with a Blue LED light source, they can emit light across the entire color bandwidth required for TV viewing. Taking advantage of Quantum Dot properties, TV makers can enhance the brightness and color performance of LCD TVs above current capabilities. The image above shows both the structure a quantum dot (on the right), a hypothetical example the relationship of Quantum Dot color emission properties according to size (on the left), and the method by which Quantum Dots are actually manufactured (looks like something out of Dr. Frankenstein's lab or college chemistry lab). Once Quantum Dots are made, the different size dots can be placed either randomly or in a size-organized manner in a casing that can be placed within an LCD TV (with an LCD TV the dots are typically two sizes, one optimized for Green and the other optimized for Red). The image shown on this page illustrates how Quantum Dots can be used in an LCD TV, according to the type casing used. Placed inside of a casing (referred to as an Edge Optic) along LCD panel edges between a blue LED edge light source and the LCD panel (for edge-lit LED/LCD TVs). On a "film enhancement layer" placed between a Blue LED light source and the LCD panel (for Full Array or Direct-Lit LED/LCD TVs). On a chip that is placed over Blue LED light sources along the edge of an LCD panel (for edge-lit LED/LCD TVs). In each method, a Blue LED sends light through the Quantum Dots, that are then excited so that they emit red and green light (which is also combined with the Blue coming from the LED light source). The different colored light then passes through the LCD chips, color filters, and on to the screen for image display. The added Quantum Dot emissive layer allows the LCD TV to display a more saturated and wider color gamut than LCD TVs without the added Quantum Dot layer. Shown above is both a chart and an example of how adding Quantum Dots to LCD TVs can improve color performance. In the chart at the top is a standard graphical representation that illustrates the full visible color spectrum. TVs and video technologies cannot display the entire color spectrum. Keeping that in mind, the triangles displayed within that spectrum show how close various color technologies used in video display devices approach that goal. As you can see from the referenced triangles, LCD TVs using traditional white LED back or edge lighting display far less than the NTSC color standard that was adopted in 1953 for color transmission. However, as you also see, when Quantum Dots are added into the mix, color on an LCD TV has the capability to extend out far enough to meet NTSC color standard requirements. The practical effect: Colors are more saturated and natural, as shown in the comparisons below the graph. Quantum Dots can also be used to fulfill the needs of both HD (rec.709) and Ultra HD (rec.2020/BT.2020) color standards. Chart comparing LCD TV With Color IQ Quantum Dots vs OLED TV. As mentioned in the intro to this article, LCD TVs are the most common type used in households throughout the World. However, LCD TVs have drawbacks in color saturation and black level performance, especially when compared to Plasma TVs. The incorporation of LED black-and-edge-lighting systems has helped somewhat, but that hasn't been quite enough. As a response to these shortcomings, the TV industry (mostly LG) has been pursuing OLED as the solution, as TVs incorporating OLED technology can produce both a wider color gamut and absolute black. Although OLED is hailed as a better alternative to LED/LCD, after years of promises and failed attempts to reach the market, in 2014 only LG and Samsung entered the TV market with large screen OLED TVs that were introduced at CES 2013 using two slightly different approaches. LG utilizes a system referred to as WRGB, which is a combination of white light-emitting OLED subpixels and color filters to produce images, while Samsung incorporated true red, green, and blue light emitting OLED subpixels. Samsung dropped out of consumer OLED TV production in 2015, leaving LG and, and Sony, as the sole sources for OLED TVs targeted to the U.S. consumer market. OLED TVs really do look great, but there is one major issue that is stopping the rest of the TV industry from bringing OLED TVs to the market on a mass scale, cost. Despite the claim that LCD TVs are more complicated in structure than OLED TVs, the real fact is that OLEDs have been more expensive to manufacture in the large screen sizes required for TVs. This is due to defects that show up in the manufacturing process that result in a large percentage of OLED screens rejected from use for large screen sizes. As a result, most of OLED's supposed advantages (such as being able to display a wider color gamut and deeper black level) over LED/LCD TVs are stifled. Taking advantage of OLED's production problems and the capability of incorporating Quantum Dots into currently executed LED/LCD TV design (and very little change needed in the assembly line), Quantum Dots may be the ticket to bring LED/LCD TV performance closer to that of what TV makers were hoping for with OLED — and at much lower cost. Shown on this page is a chart comparing the brightness, color coverage, and power consumption requirements of two Sony LED/LCD TVs that incorporate Quantum Dots with the first generation OLED TVs released by Samsung and LG. Without getting into a lot of technical detail, when you compare all four sets, you find that color coverage the two Sony Quantum Dot — equipped LED/LCD sets used for comparison, and the original Samsung OLED set are very close, while the LG OLED set actually appears to under-perform. On the other hand, while the Samsung set is capable of high brightness output, both the Sony Quantum Dot LED/LCD and LG OLED sets are very close. However, the most telling difference is in power consumption. The OLED TVs consume more power than either Sony set used in this comparison, especially when you further consider that the 65-inch Sony 4K set consumes less power than either 55-inch OLED TV. This would mean, barring any engineering advances in future generations of OLED TVs, that a 65-inch OLED TV may consume more power than its quantum dot-enabled LED/LCD TV equivalent. While LED/LCD TVs consume power on a more steady level regardless of brightness output (although other features on the TV, such as Smart TV, etc., when engaged can affect power consumption), OLED TV power consumption changes with the level of brightness required to produce images. So, the brighter the content, the more power that is consumed - and of course, engaging Smart TV and other features will also change this as well. So, as you can see as shown in the chart, the extra cost factor in both manufacturing and purchasing an OLED TV may not deliver that much of an improvement over a Quantum Dot-equipped LED/LCD TV. The main providers of Quantum Dot Technology for use in TVs are Nanosys and 3M, which provide the Quantum Dot film (QDEF) option for use with Full Array backlit LED/LCD TVs. On the left side of the photo shown above, the TV on far left is a Samsung 4K LED/LCD TV, and just to right and the bottom is an LG 4K OLED TV. Just above the LG OLED TV is a Philips 4K LED/LCD TV equipped with Quantum Dot technology. As you can see, the reds pop out more on the Philips than on the Samsung set and are slightly more saturated than the reds displayed on the LG OLED set. On the right side of the photo are examples of Quantum Dot-equipped TVs from TCL and Hisense. The use of Quantum Dots has taken big leap forward as several TV makers have shown off Quantum Dot-enabled TVs at tradeshows including Samsung, TCL, Hisense/Sharp, Vizio, and Philips. 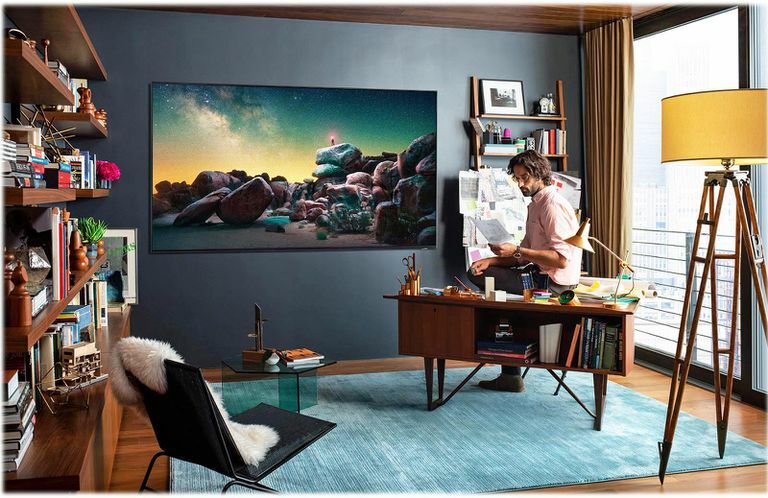 Of those, Samsung and Vizio have brought models to market in the U.S. – Samsung brands their Quantum Dot TVs as QLED TVs, while Vizio uses the term Quantum. Strangely enough, LG, which displayed some Quantum Dot TV prototypes in 2015, apparently decided to back off, and put more resources into their own Nano Cell technology in select LCD TVs as well as making more expensive TVs using OLED technology. With LG and Sony (as of 2019) being the only makers of OLED TVs (Sony OLED TVs use LG OLED panels) for the U.S. market, the Quantum Dot alternative for color enhancement offered by Nanosys and 3M might enable LCD to continue its marketplace dominance for years, and decades to come. Next time you go shopping for a TV, check to see if it has the "Color IQ", "QLED" "QD", "QDT", "Quantum" or similar label on the set, or in the user guide – that will tell you that the TV is utilizing Quantum Dot Technology.